CND unveiled 24 gilded nail designs at The Blonds Spring/Summer 2016 Show at MILK Studios during New York Fashion Week. The Blonds Spring/Summer 2016 was a regal, glistening runway show of avant-garde fashion and artistry inspired by Cleopatra, the Sphinx and various elements of Egyptology. 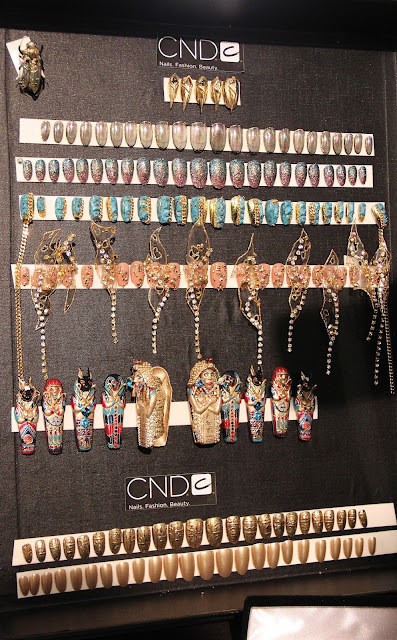 The elite artists of the CND Design Lab Team hand-scuplted the nails and their larger-than-life embellishments with CND Liquid and Powder and BRISA Gel, then added layers of color with SHELLAC Brand 14+ Day Nail Color, VINYLUX Weekly Polish and CND Additives. Royal golden tones ruled the color palette - antiqued, shimmering and expensive - while accents of blue, turquoise, red and green added texture and dimension. 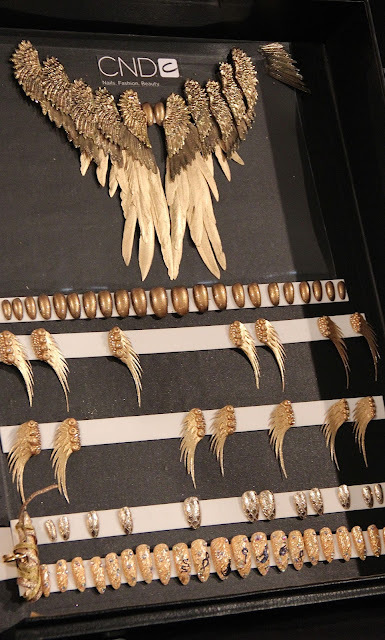 Hieroglyphics, snake and crocodile skins, gold-plated wings, draped headdresses and scarab beetles were constructed and embellished with an array of unconventional materials, including feathers, foils, ribbons, chains, gems jewels and stones. A sarcophagus nail even opened to reveal a mummified pharaoh donning the actual golden locks of designer Phillipe Blond. These highly sculptural designs resulted in over 600 combined hours of production. 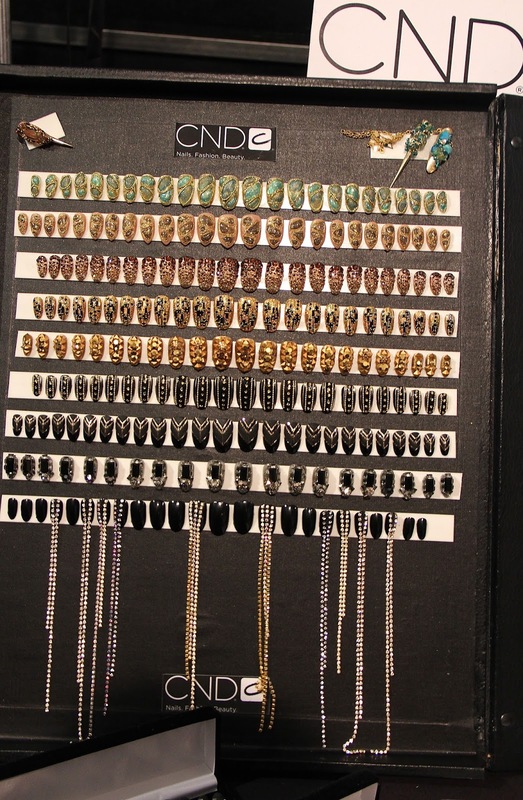 Lead hairstylist Kien Hoang for Oribe Hair Care takes us through hair looks reminiscent of a Pharaoh's headdress. 1. Divide hair in half by sectioning from the front crown to the nape. 2. Create two high, tight ponytails (pigtails). 3. Braid each ponytail and wrap into a bun. 4. Using half of a mesh hair donut, secure it in a crescent shape on top of each bun, and then pin securely. 5. Prep the wigs using Dry Texturizing Spray ($42) on the roots and Soft Dry Conditioner Spray ($36) on the ends. 6. Form and mold the wig into a triangular shape using Superfine Strong Hair Spray ($37). 7. Attach the wigs to each form on top of the bun. One secure, use clippers to cut a blunt, lip-level bob. 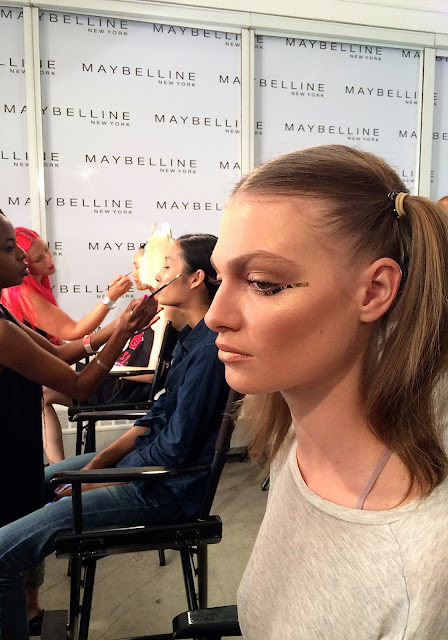 Kabuki takes us through the make-up look this season. 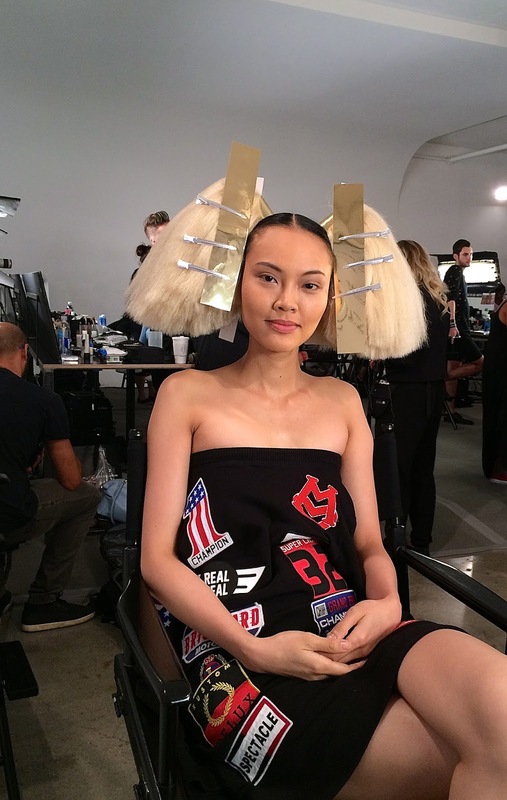 "I would describe The Blonds collection as a fantasy of ancient Egypt set to a disco beat," says key make-up artist Kabuki on the inspiration for the make-up look this season. "I tried to capture this feeling by using lots of gold-on-gold tones and shimmers." The most theatrical element is a handmade gold chrome applique to immitate Egyptian eyeliner and compliment the jewelry.